Takers – these people are only interested in what they can get personally from others. Matchers – these people, in the vain of reciprocity, will ensure there is a balance between giving and taking. Givers – these people just focus on giving and are tuned into how they can be of help to others without the explicit interest of getting something back in return. Of course, they do set some boundaries around their giving too as to not burnout either. Let’s explore the ways we can give back…. Time can be our most precious resource and it is also one of the simplest resources we can give. Giving our time to our family, our team and colleagues or to a worthy cause can be a brilliant gift. Often in our western culture, our time is so much more valuable than any ‘thing’ we can give. Looking for ideas? You might not need to look very far, your local primary school, aged care home, dog refuge or local charity might be looking for an extra pair of hands. If you’re in need of some ideas, check out your local Volunteering website. Donate to your favourite cause. Interestingly a philanthropist is not defined by how much money you give but one who invests careful consideration and effort into a donation (or time, money, networks or skills) to a cause that promotes humanity. You can do this individually and/or as a family. For example, the adults in my family have a Christmas ritual instead of giving presents to each other, we pool some funds and donate it to a charity that we believe in. It’s wonderful when, as part of this process, you can share with your family the causes that are meaningful to you, talk about the experience of giving and share in the outcomes of your giving. There are a number of ways you can give your expertise to others. You can write and blog about your experiences, you can volunteer to speak, you can mentor people you see potential in or you can become a board director for a community organsiation. Your area of expertise can be extremely valuable and not just your traditional skillsets such as legal and accounting but there are so many emerging skillsets that are so valuable on a community board these days. Consider what organisations could be over the moon happy to tap into your expertise and consider donating a couple of hours a week for a year to share your expertise. Declutter the house and the pantry and give your unwanted clothes, appliances and food cans. This has the dual benefit of clearing your house as well as giving much needed resources to those in need. In the throw away society that we live in, we can forget how much some of these items that we taken for granted can mean to others. Do an audit in your house and consider what don’t you need anymore and who could you give this to. There is an excellent website called givit where you can connect with who needs what and pledge to give it to a person in need. We all have a voice to highlight causes that are meaningful to us. Use your voice to promote good causes. You can write for your workplace newsletter or personal blog, share a cause to your networks on social media and go one step further by actively engaging your networks to support a cause. This might by organising a table to a Gala event, for example. You could organise a morning tea with your friends to connect and raise an issue that is close to your hand. Consider the avenues that you can share your voice and actively use it! According to Adam Grant’s book, be a giver and give without expectation. It might just impact your leadership! Now over to you: How are you giving back and also giving forward? Join the conversation here. Firstly – THANK YOU! I am so grateful to you for reading my blog, sharing in my community and supporting my work. It really means the world to me. I feel incredibly humbled by your support and appreciate the difference you make to my life. Our flagship online course, Board Ignition, is growing and more excitingly it’s succeeding in getting people onto community boards. And more importantly, graduates are getting onto boards! In 2019, we are upgrading the course again with new case studies, worksheets and practical challenges. We do have a special offer on the course until the 31st December if you’re keen to do the course in February next year. Wow – the people we have coming onto the Emerging Leaders in Governance program just get more impressive every year, it’s a joy to work with these outstanding values driven leaders. This program which culminated in May has already seen half of the participants get board or traineeship roles. Thank you to my friend and mentor, Dr Nicky Howe, Southcare and the 42 community organisations that make that program a reality and a success! The biggest surprise this year has been the awards and recognition that has so gratefully been shared with me this year. I want to really appreciate the people who look the time to nominate me for these awards. I’m incredibly humbled by it and have tried my upmost to share this recognition with the many people who support the projects that I get the pleasure of leading and also use the recognition to further spread the messages of community service and philanthropy. This really was an incredible experience. As an entrepreneur though and though, I found it awe-inspiring to be surrounded by such talented entrepreneurs, to connect and share this experience. It was wonderful for the whole 100 Women team to be recognised too for the hard work and impact we’ve created over the last 5 years. A true celebration of the amazing talent in WA, the Western Australian of the Year Awards was a wonderful opportunity to celebrate with my friends and 100 Women team mates with what has been achieved this year. I was humbled to be recognised alongside some truly inspiring business people in Perth. Thank you to Barbara and Momentum Forum Events for naming me your Wonder Woman of the Year! What a title! It was wonderful to learn from your events prowess and philanthropic background. 100 Women – 5th Year and $500,0000 in grants given! This year we celebrated our 5th year at 100 Women. Wow – what a brilliant group of humans! I want to appreciate every single person who has donated to 100 Women over the years, you can all celebrate in this success. I want to appreciate the people behind the scenes that make this organisation happen and a special mention to our outgoing Treasurer, Grace Mugabe for 5 years of book keeping and board reporting. This is an amazing commitment and while you won’t be far from the organisation, your dedication needs to be acknowledged and recognised! Thank you to everyone who has covered us in the media this year. There are some wonderful people who support my business – thank you to Sarah, Emily and Galia from Sarah Noked. My incredible VA, Josefine, who contributes like she’s been involved in my business for years – you’re a gem!! I had two wonderful interns join my business for two months from Curtin University – Lizzie and Maddie. Their writing abilities astounded me, they have such bright futures ahead. Thank you also to Bruno Kongawoin for his incredible headshots – see my headshot in the newspaper article above! I highly recommend his work. Personally for me there have been highs and lows. Sadly my husband lost his dad this year, way too soon at 72. Ray inspired me with his dedication to his family, community and friends, his wonderful creativity and his character and determination. His beautiful funeral which his son (my husband), daughters and wife created was a celebration of life and everything that’s good in the world. Remembering our mortality forces us to focus on what’s important in life and making every day count. My beautiful kids turned 2 and 5. They give me extreme pride in the people they are becoming, their care and kindness as well as their commitment and dedication they show. As anyone with kids will attest to, it’s an immense job and always creates a full life! Thank you to my friends and family who keep me sane amongst the fullness of life, thank you for your care. Thanks to my gorgeous sister, Suzy for taking this beautiful family photo. Your work constantly inspires me. And what is in store for 2019? Board Ignition starts in February. Get into it! I’m excited to bring an upgraded Board Ignition – with new videos, worksheets and practical challenges. There is no better place if you want to make your aspiration of being a board director a reality! I will also be launching a new course in May. I can’t wait to share more about this in the new year. Now over to you: What have been the highs and lows of your year? Share it on Alyceum’s private Facebook group, Alyceum Leaders. A s we reflect on the year we’ve had at Alyceum, we wanted to share what impact has been achieved. It was wonderful to kick off the year with Alyceum being named in the Westpac 200 Businesses of Tomorrow List out of 2000 applicants. I went to Sydney to attend the official announcement and one-day Summit (complete with my 4-month-old son and my mum!). The Westpac staff were so accommodating which made attending an absolute pleasure. The inspiration from speakers such as Marc Randolph, Co-founder, Netflix, Bernard Salt and David Linberg, Westpac Chief Executive, Business Banking has stayed with me and positively impacted my year. Engaging Young Leaders on Aged Care and Community Boards program turns five! The Engaging Young Leaders on Aged Care and Community Boards program celebrated 5 years and we introduced the new Difference Makers Diversity Awards. We had a very successful Emerging Leaders in Governance program and two outstanding Unconventions. It’s been an amazing journey to lead and facilitate this incredible program in Perth. Thank you to Southcare and the strong collective of Not-For-Profit organisations that I get to work with on this program. The book, Difference Makers, I co-wrote with Dr Nicky Howe continues to make an impact. Here we are with the WA Premier, Hon. Mark McGowan at the launch of the Women Onboard Portal to encourage more gender diversity on government boards. I’m offering an End of Year special for any board would like a board book pack (10 copies – 1 for each board director at a reduced rate). In 2017 Alyceum launched the #1000youngdirectors campaign to shine the spotlight on young board directors of Not-For-Profit organisations from around Australia. It was wonderful to profile such dedicated and engaged young professionals who are making a difference to their community. Nominate yourself to be profiled here. We also launched the online Board Ignition course to empower young professionals to gain their first community board appointment in June this year. 8 modules, 11 board director interviews and one live round of the course with 4 online webinars! Last month in November we trialled a very unique live round of the Board Ignition course where I held weekly webinars with online participants. All participants of the course get access to the webinar recordings making it an excellent online course to complete. I got to work with some amazing clients again including BHP, RAC, CPA Australia, WA Football Commission, Australian Health Promotion Association, facilitating workshops this year on leadership, facilitation skills, board leadership and diversity. I love the people I get to meet at these presentations and workshops. Here are all the female directors currently sitting on Football boards below. Their drive, leadership and determination is exceptional. I continued my involvement and commitment to 100 Women as Board Chair. Our collective giving circle raised nearly $100,000 this year and funded four projects in WA, Australia and overseas. You can read my wrap up of our Gala Celebration here. It was a very special night featuring one of our grant recipients, Girls From Oz. I was also excited to meet the girls who are from Halls Creek and provide a complimentary leadership workshop while they were here in Perth. An absolute highlight of the year was the opportunity to speak in front of 1500 people at the Perth Concert Hall for TEDxPerth on the power of collective giving. I don’t think you could get a better audience – warm, engaged and open. I wrote about the experience here. Pro Bono Australia – The social sector’s most essential news coverage. It’s been a successful year and with some exciting plans in the works for next year – bring on 2018! I traveled over with my 6-month old son and my mum who cared for him so I was able to attend the Summit. Big props to Westpac too for making them feel so welcome. Talk about the new way of business! The innovation process is about your ability to have lots of ideas, validate them as quickly and cheaply as possible until you find one that sticks. Innovation needs persistence and optimism. Take your ideas and collide with customers. Attract your tribe through content that shows who you are. Technology can help you scale the human experience. Key business trends include running service based businesses, selling to (rather than buying from) China, automation and robotics, purpose in business, gig economy and changing demographics. Australia is not creating big businesses. All our major businesses where founded in the late 1800’s and early 1900s (think BHP, Telstra, Wesfarmers, Woolworths and the Banks) compared to 5/10 of America’s biggest businesses (Think Apple, Google, Microsoft, Facebook and Amazon) which were founded in the last 30 years. It was a fantastic Summit to meet inspiring entrepreneurs from around Australia and think about society will look like in 2020, 2030 and 2050. Thank you Westpac for the honour of being named in the inaugural list and for the Summit experience. Register here and receive a free chapter of my book, Difference Makers: A Leader’s Guide to Diversity on Boards. The question is not why would you involve a young professional under 40 on your NFP board. The real question is why wouldn’t you? Why do we need more diversity on boards? Research undoubtedly shows that diversity improves financial performance, innovation, reputation and decision making. This occurs when a wide range of perspectives are taken into consideration¹. This means including diverse perspectives is not only the right thing to do morally, it’s also good business sense! What is the current diversity on boards? Is it any better on NFP Boards? So yes, there is work to be done! Igniting 1000 more young directors (under the age of 40) on community boards is a MASSIVE goal. So here’s how we want to support change! Each Wednesday (starting tomorrow! ), Alyceum will profile impressive young board directors from around Australia. We have an incredible list of young board directors to share with you already. You will find them on our Facebook page and Linkedin page. If you would like to be included in this series or know someone who should be profiled, complete the form at the end of this post. Please use the hashtag #1000youngdirectors to share wins, add resources and promote the young board director profiles! We will be blogging tools and resources and hosting online webinars here to help you get onto community boards. Discover what it means to be a board director, what the role involves, how to find a board position and more! You may want to sign up to our mailing list! Fast track your board journey here! Alyceum has created an exciting online resource for young professionals (or anyone!) who are keen to get their first community board appointment. We have a very special pre-order offer during our launch month – June 2017. So if you’re keen, this is the course for you! 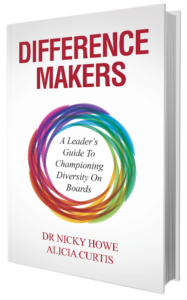 Alicia Curtis along with Dr Nicky Howe have written a practical board guide for championing diversity called Difference Makers: A Leader’s Guide to Championing Diversity on Boards. As part of this campaign, we are promoting a Board Book Pack of 10 books for your board directors for $240. This is a 20% discount on the retail price of $29.95 each plus we will ship to you for free! Order your Board Book Pack here. If you’re under 40 years old and on a community board, add your details here to be profiled in this campaign. Please like our social media pages too (our Facebook page and Linkedin page). Join and support the #1000youngdirectors campaign to promote and recognise age diversity on boards. What state do you live? Share 1-2 sentences about your experience as a board director. Share a piece of advice for aspiring board directors to attain their first board position.